As my class considers the construction of reality I turn to the writings on persuasion and consider rhetoric. It’s not just that realities are constructed—shaped by our brains, our minds, our beliefs, our experiences, our knowledges—they gain traction in the world of persuasion. 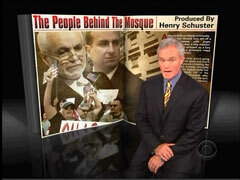 Take the example of a recent 60 Minutes report on the so-called Mosque at Ground Zero. The news report presents the perspectives of the developer of a high rise, the religious leader of the community that gathers downtown to play and pray, and the blogger who opposes the development and coined the phrase Mosque at Ground Zero. The 60 Minutes interview introduces the community’s imam and developer as rational, peaceful citizens of the US who want to offer recreational space, in addition to prayer space, a few blocks from Ground Zero. The imam told 60 Minutes he is “waging peace” and condemned religious zealots and their actions on September 11. In contrast, the woman who opposes the recreational center has used her sharply honed media management skills to move the mosque to the top of the media agenda and rally opposition to the mosque. Pamela Geller is described by 60 Minutes as a far right political blogger. According to the students in my class, she is also presented as shrill, self-indulgent, and hysterical. The students accord her little credibility. Geller reframes reality deftly. The reporter (Scotty Pelley) implies that some of her claims are false when he asks: “To what degree are you obliged to tell the truth?’ Geller’s response is that she is telling the truth: “That’s all I do is tell the truth.” When Pelley points out that there’s no actual mosque planned at Ground Zero (the recreation center is a few blocks away), Geller reframes reality. The sentence gave me pause. Truth is the new hate speech. I asked the students in class how to reconcile the sentence. How is truth also hate? Geller goes on to state that she tells the truth, that people hate the truth, and that she is a hero for stating the truth. But, in my view, Geller has reframed the journalist’s question to suit her own agenda. This is hardly a new technique. Media savvy entrepreneurs will teach you how to speak to media, how to “keep on message,” and how to reframe a question so that you take control of the interview. On the face of it, and outside of any context, to make a claim that “truth is hate” seems pretty looney. But in the interview, it’s probably a brilliant move. The focus moves away from Geller’s fibs to the notion that hate follows truth, confusing the issue entirely and refocusing the discussion on Geller’s prime directive: to associate the Moslem cultural and recreational center with hate. Seems like Geller is the one promoting hate. This entry was posted in framing and tagged rhetoric. Bookmark the permalink.